Superior in quality and performance, FF-400 is a high performance gas detection equipment that can be designed as per requirement. 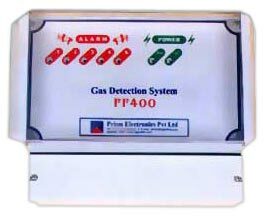 FF 400 is a precision engineered gas detection equipment that comes with a field replaceable unit complete with gas sensor, terminal / junction box, gland and more that can be designed as per requirement. FF-400 is very easy to use and install and the superior design ensures interferences from electric noise, temperature, humidity and pressure. Output Driver for Auto shut-off valve, Suction Pump, Annunciation Panel etc. Diffusion : Suitable for open air monitoring. Gasflows under natural convention. FLP enclosure suitable for classified hazardous areas. LM-6alloy enclosure certified for IIA/ IIB/ IIC gas groups. LPG/ LNG users, Gas Banks, Hotels, Flight Kitchens, Industrial Canteens, Godowns, Shopping malls, Laboratories, SSI Units, Textile Industries etc.